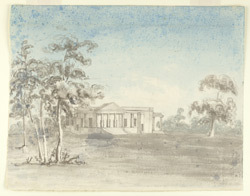 Water-colour and pen and ink drawing of Palladian house, Bhagalpur in Bihar by Marianne Jane James (b. 1805) in 1828. The artist recorded the following, 16 July: ''Landed in the evening at Boglipore ... very warmly received by Mr and Mrs Nisbet ... they have a delightful house and park and it is the healthiest station on this side of India ... I made a sketch of the house and also of a very picturesque temple at a short distance''.